The night before last, I got no sleep. Zero minutes of sleep. None. Although insomnia hits me often–averaging every second night–I usually get at least two hours of sleep in. I know this because my Fitbit tells me so. But that night, nothing was allowing me to fall asleep. Why am I telling you this? Because something interesting occurred and was “recorded” by my Fitbit: for the hour or so of tangling to help me relax, the app decided that all it’s measurements showed I had slept for 49 consecutive minutes! No, I wasn’t actually sleeping during that time. I was tangling, and was apparently deep enough into a relaxed, meditative state that Fitbit believed I was asleep. Since I have my sleep measures set to “sensitive,” the device doesn’t count any periods of movement of any kind as sleep time. It calls it restless time, possibly because the app has no way of knowing if I am simply in a less deep state of sleep or if I am in a waking-up state. So it does not count those periods as sleep. Since it is hard to draw without moving, all my other body signs must have fooled the app into thinking I was in an actual sleep state. 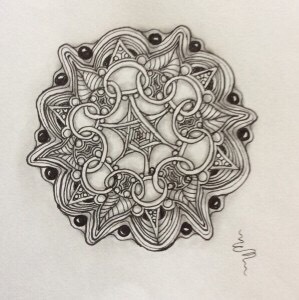 Even though I already experience the restful nature of Zentangle, it was both surprising and welcoming to have the meditation state and time confirmed by a scientific device. Just another reason to tangle on! Next Post Color My World Blue! I find this interesting. Aside from what is in Drawing on the Right of the Brain, I haven’t done any reading on the topic. However, I am aware of that state we get into while being creative. It’s something I look forward to. I was kind of surprised it even happened while working on digital art. Have you tried melatonin? I know some people don’t like to take pills to help them sleep and I understand that. It just seems like melatonin is a more natural way to approach the problem.